Today i am going to Introduce how to Set up your Web/Windows Project in Install Shield.So that you can able to Set up your Application with a Clean Interface and detailed System Requirements or Prerequisites that are needed or validate for your Project to install in Client System. The Install Shield have had four types of Versions.one is Limited version which is available with free of cost.The others are Premium/Express/Professional Editions.In Limited Version of install shield you will have Limited Features where as the Others having different Features based on their Editions. Whenever you want to work with install shield You need to Register in the following url http://learn.flexerasoftware.com/content/IS-EVAL-Install Shield-Limited-Edition-Visual-Studio.You will be having one Register key attached to that.Use that attached Register key for Installing the Product in your system. Application Information : The Application Information Contains to specify some brief introduction of Your Setup project i.e You can specify the version of the Software,company name.You can change the Logo of the Set up project. Installation Requirements : Another Important Key feature of the Install Shield is this.You can check list of the Requirements that are needed to setup or install the Project in the Clients Computer.If the Requirements cannot meet the Client Computers Software such as Operating System/InternetExplorer/Sqlserver/IIS(custom requirement) then your installation or setup Project will not Proceed further.You can add a Custom Requirement with this option and it is available in the Limited Edition. 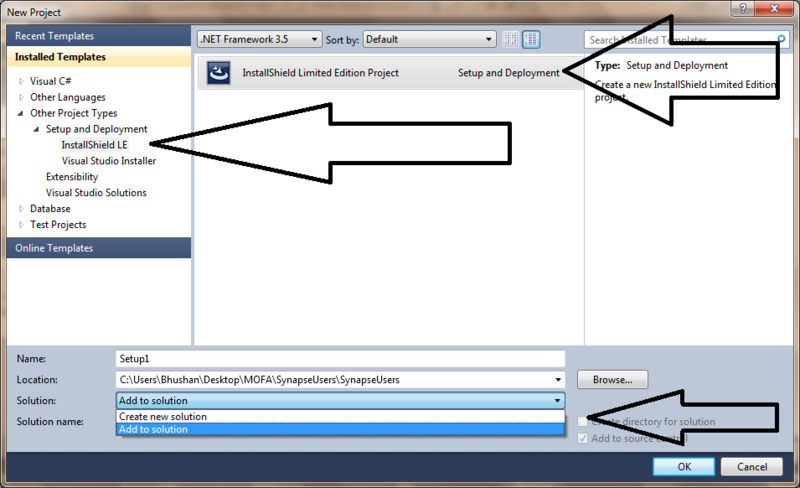 Application Files : whatever the project Content Files and Build primary outputs of exe are attached in the install shield will be placed in that location of the Client Computer.You can add Project Outputs ,Files and Folders with this feature. Application Registry: Some application require that information to be stored in Windows Registry.So that it will determine what entries your application require. Installation Interview :Its the last but not the least feature in this Project Assistant .You will provided with Questioner sheet.So that it will work us based on the Answers you feed whenever your installing on client computer.The Most important in the installation interview is that you can give users an option to launch Application automatically when the Installation Completes. Whenever you clubbed two or more different in one Install shield.You can choose the main Project to launch in clients Computer.So that the Setup of the project will be automatically installed as soon as all your prerequisites and requirements are Validated. General Information : This Feature has got some important Characteristics or attributes by changing those attributes Yo can create Msi logs with text file where you can know the Build errors and Setup installation failures mentioned with date and time.You can have fast install by reducing the Message frequency.And can Create Administrative Privileges so that the setup will not installed without any admin rights. Setup design:This Feature Enable the Design Changes or Graphical Interface or Look and feel Changes of the Setup.But it will not available in the Limited Edition. Features : This feature will enable us to give Client a Meaningful information i.e You can Upload tutorials ,Help files,Image Files and Spell Checker in the Install shield. Set up Types :There are three types of setup Typical, Minimal and Custom. Typical will be Installed the Most.Custom only selected to some requirements.Minimal are only the Necessary requirements are installed.But this Feature will not available in Limited Edition. Upgrade Paths: If you have installed one Software Version in the Clients Machine if you are again going to install the Same Software with another version in the Clients Machine where you need not install all the features from the beginning. 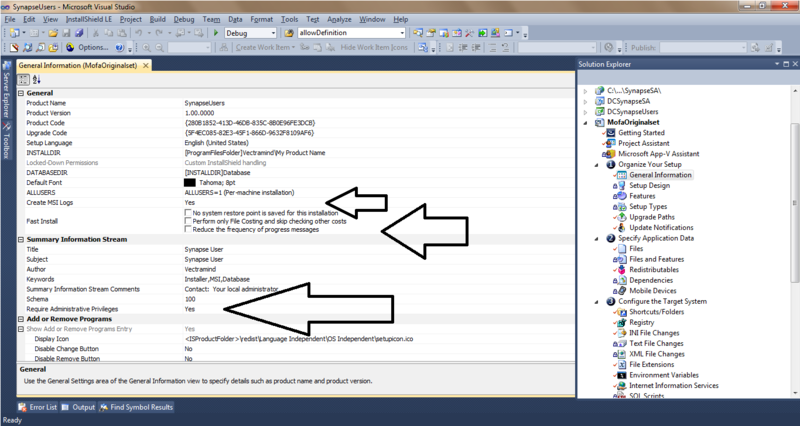 The Next one is specifying the Application Data the Files will be viewed in four different parts. Source Computer Folder and Destination Computer Folder source computer files and Destination Computer Files.you can drag the specified source computer file in specified Destination Computer file. Files and Features : The Limited Edition can not have this Feature.It is the same as Features in organize setup.But you will have a spell checker for some Languages(i.e Japanese,Chinese,Arabic...e.t.c). Dependencies files:This is about scanning the Files in the Client Machine.But will not available in Limited Version. Mobile Devices :This feature Enables to work with Mobile device application.But not available in the Limited Edition. 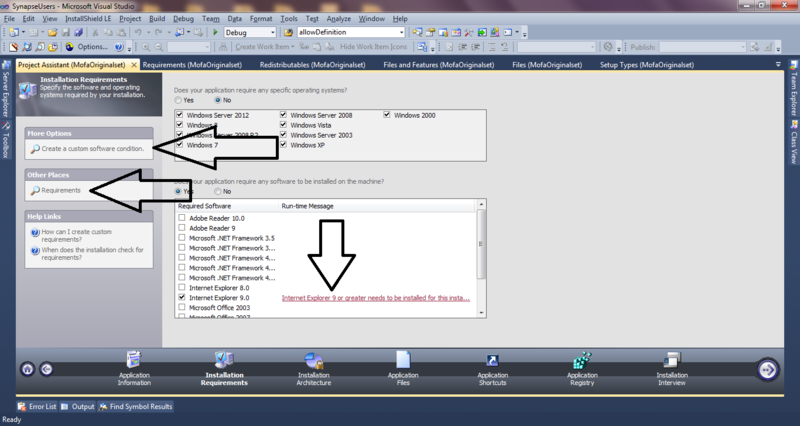 Shortcut Folder: This feature will enable to set up the folder on that particular location. Registry key: The Registry key will be added to the destination computer from the Source Computer. INI File Changes :Ini Files are Used as alternative for web config files.Where you can create Section Name and the Key value.where this ini file will be installed whenever your Setup install in the Destination Computer. Text File Changes : Suppose you want to find and replace the Product name with specified Product name this feature is important but will not available Limited Edition. XML File Changes : This Feature enables you change the Nodes that already Existed in the Client Computer or your installed Project at run time. But this Feature will not be available in Limited Version. File Extensions: File Extensions feature enable us to view the Associate files of the installed product. Environment Variables: Environment variables are the variables that will be accessed multiple applications in the target System.You can add a new environment variable with this Feature and most importantly this feature available in the Limited Edition. the IIS in the Target Machine. SqlScripts: You can add a new sql scripts in installing the Project in your Target System.You have to specify the Connections of the Database associated with that sql script. But not available Limited Edition. Customize the Setup Appearance : In this Feature there are Dialog s,billboards,Text and Messages.This Feature will helpful whenever you want to made certain text and Message changes for the Product.This feature will be available. Dialog s were Used to change the images of the Install shield. Like the logos and images of Your Product.And you can describe just path of the Local image of the System and it will automatically install in the Target Machine. Bill boards :This Feature Enable the Flash images in the System.But not available in the Limited Edition. Define setup and Requirements :You need to specify or define System software Requirements as system Hardware Requirements that are need to install the Project in client Computer or target Computer. Install ScriptInstall Script is a powerful feature that is available in Installed shield.It supports several hundreds of built in functions. prepare and ReleaseThe prepare and Release is the final part of the install shield which will allow you to view the log files , installed files and setup exes after successfully built in the Project. Errors are notified through log files.why the Setup has failed.